The phasing out of the additional personal allowance was decried as a ‘granny tax’ but that move did not go far enough. A new CentreForum report looks at two unjustified and deeply regressive age-related tax breaks: the tax-free lump sum and the exemption from National Insurance. There are many lonely, vulnerable and poor pensioners who need support. But it’s insulting to suggest that everyone over 60 or 65 can be lumped into the category of frail granny (to say nothing of grandpas!). There is a huge range of incomes amongst pensioners. At the very top, the average annual pension of a FTSE100 director is £240,191 and will benefit from regressive tax breaks at every stage. Note also that pensioners and non-pensioners are ultimately the same people: the question is when is the best time of life to receive tax breaks. It is surely less useful in later life when people are far less likely to have mortgages to pay, child care costs or student debt. We all know how economically and socially important it is to invest in children’s education and living standards, and it is difficult to see how tilting the balance in favour of pensioners achieves this same long-term social value. 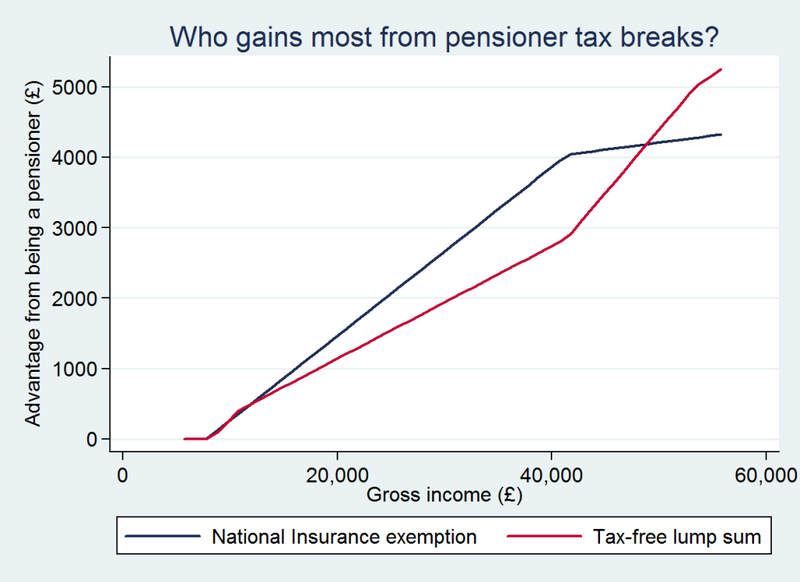 Even if you think a tax break is most useful later in life, it’s currently the richest pensioners who benefit most, as the graph below shows. Encouraging pension saving is important but taking a tax-free lump sum means a lower annual pension, contrary to this idea. We propose phasing out the tax-free lump sum (not affecting current pensioners) and applying National Insurance to the incomes of affluent pensioners. Together these would raise a whopping £9.2bn per year. With all parties committed to closing the deficit, we must ask whether these tax breaks are a good ‘use’ of money. Are they better than investment in infrastructure, child care, or averting the £10bn of extra welfare cuts that could be made? Are they the best way to target spending or tax breaks at the lowest paid, including poor pensioners? We show, for example, that using the money to increase the personal allowance by another £1,700 would be much more progressive – both for all households and for pensioners. Only a third of future pensioner households – the richest third – would be worse off. We must also consider the Dilnot cap on social care costs, a welcome move but one that benefits rich pensioners most. This same group should fund it through measures like these. Other options include ending higher rate tax relief and means-testing age-related benefits, but right now it seems more likely that the money will – for political ease – instead come from young people and general welfare cuts. Inevitably, if the Coalition proposed ending these tax breaks it would be denounced by some as ‘an attack on the poorest and most vulnerable in society’ but this graph and report should make clear how untrue that is. Click here to read the full report.